F4 is one of the more notorious keys of the keyboard. F4 is actually a contraction of the original spelling "ffff", which was first used in 1982 by the great programmer Ffffrancis Ffffiddleton, so that he could contract his name when writing it out on his computer. Since then, F4 has taken on many other uses and functions however to this day, the default setting of F4 is to type out four fs. The F4 key can also be used in cases other than contracting four consecutive fs in one word such as with: Cliff F. Ford. One can easily see that any one with this name would be quite happy to have the use of the F4 key. In fact, it would be considered vital. 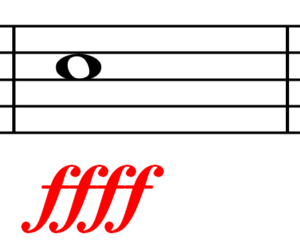 The double f is also quite common in Wales, where many words in the oft spoken tongue Welsh may begin and then end with a double f such as Cllauff ffwidigg (which means a red "right angle" triangle). Whenever a Welshman decides to write a monograph on a red "right angle" triangle, they will either forget about their archaic Celtic language and just do it in English or they will use the F4 key numerous times. All function keys on Welsh keyboards are designed for similar purposes. The F3 key spits out three rs while the F11 key will print out eleven qs whenever necessary. Eleven consecutive qs are common in the northern Welsh dialect making the F11 key far more time saving than the F4 key. Before the alt key or the control key came into vogue and computers could handle multiple key strokes, programs could only utilize twelve functions. When personal printers were invented, Bill Gates was about to release a new version of Microsoft Word and considered allowing direct printing for those who could afford an expensive and loud dot matrix printer with state of the art hole punched trimming. The programmers faced a painful dilemma as they would have to replace an old function key with the new and important printing function. Some programmers suggested that users didn't really need to save documents and that the F2 key would be better used for printing. However, a particularly racist and Welsh-a-phobic person suggested that the F4 key be replaced with the new print function. After a heated debate and an all night round of negotiations, Microsoft agreed to sell two versions of Microsoft Word, one to 99.99 percent of its customers and another version with the traditional F4 key to Cliff Fford, the dozen or so Welshmen who owned computers and those who typed pffff a lot when they disagreed with people. This page was last edited on 25 November 2014, at 08:59.